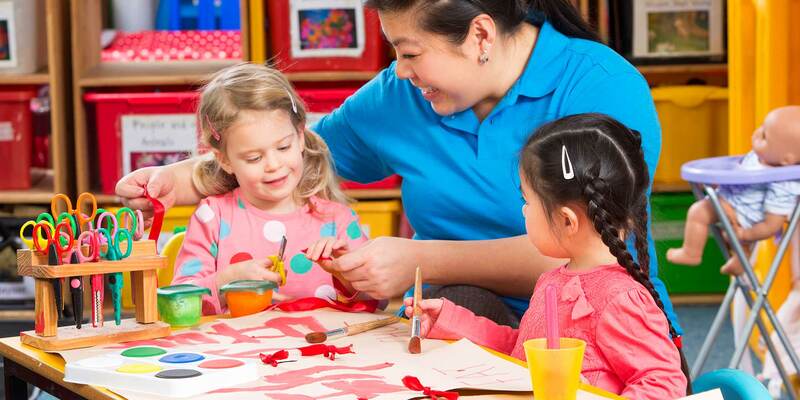 Believe it or not, February is here and it’s time to have some fun with the children at your child care or preschool with Valentine crafts and projects. We’ve put together a few of our favorite links to craft ideas from around the web. Try one and let us know how it worked for the children at your center. This idea comes from TeachPreschool.org. Use a heart-shaped cookie cutter for children to create heart designs and write with their fingers in a salt tray. You could use fine grained sand instead of salt, but the white salt has a nice look when using red and pink cookie cutters. This one is from ToddlerApproved.com and shows how to make flowers with small, finger-painted hearts and stems, and a construction paper vase. The example shows it in 2D on flat paper, but you could use a thicker card-stock style paper with a cylinder of construction paper for a vase and end up with a 3D masterpiece. Also from ToddlerApproved.com, the yarn valentine is easy; just cut short lengths of yarn, glue them on a paper heart shape and wait for the glue to dry. Yes, waiting is the hardest part! DaniellesPlace.com shows examples for a variety of valentine card holders using empty tissue boxes or even paper plates. The children can be very creative as they design their own card holder. Some of the examples are pretty elaborate, but they do give you some good ideas to use as a starting point. This one is very clever, from FaveCrafts.com, with ornaments created from red, pink and white buttons. It may be better for older children, perhaps school age, as it involves bending a thin colored wire through the button holes to make a heart shape. Here’s a classic recipe to make hearts from salt dough from teachpreschool.org. Leave a hole in the dough so you’ll have a place to insert a ribbon when you’re through. A couple of good ideas from preschoolinspirations.com include taking an inexpensive picture frame and gluing candy hearts or other colorful candy, like red hots, all around the frame for decoration. The hard part, of course, is not eating too much of the candy. Hands-on activities can be a great way to get kids excited to learn! Fun science projects get everyone at your child care or preschool experimenting, learning, and having a great time. It is very helpful with the billing, attendance and immunization. The parents also love the ease of the use of the program.